A: In regards to the series, you have talked a lot in the past about writing Supergirl again. One thing I noticed was all of the homages and references to all Supergirl and continuities in the past (as well as many other comic references). 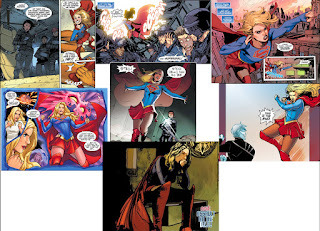 Was infusing this series with a ton of Supergirl history one of your goals from the start? Or did that just sort of happen? SG: It’s a hard line to walk sometimes. You don’t want to make a story so overly-referential that it’s indecipherable to a broad audience. I feel like good comic book stories – stories told in the grand scheme of this serialized artform we all love – will make reference to what’s happened before in some way. Y’know, when I was growing up, you had Editor’s Notes all over comic stories to point you back to previous issues that you’d immediately want to hunt down and discover. A stray Editor’s Note about the Flash could lead you back into the Flash’s history, and I loved that. I think comics shy away from that now to a large degree, because we collect everything into trade paperback volumes and then number them one through whatever. In theory, you now never need the guiding voice of an editor to send you back to a decades-old issue. If you’re really curious, you can just Google! When I approached this story, I knew that I wanted to reference Supergirl history in a way that I never had before, going all the way back to the Silver Age and the ‘80s and New Krypton and Peter David’s Matrix run and even stuff from DC Bombshells. I love all that stuff, and wanted to find ways to pay homage to the creators and stories that had come before me. I mean, all creators working on characters like this stand on the shoulders of the giants who came before, right? My editors at DC very graciously allowed us to indulge in the references as long as they didn’t distract from the greater story at large. Hopefully, we accomplished that! Supergirl has a long and storied history in comics – she’s been a huge character for DC Comics for almost 60 years -- and I thought it important to show new readers that even as we tell this story set in the tv universe. A: The Alura/Kara relationship was a big part of your first run with the character. Here Alura is more like an iconic presence looming over Supergirl. Despite being purely from Kara’s perspective, I think their relationship changed a bit in this book. What was it like writing the two of them again? What do you think Kara thinks of her mother in this continuity now? SG: I think Alura/Kara is one of the most complex and interesting relationships in comics. And really, how often do we see mother-daughter relationships in comics? Usually it’s father-son relationships that drive a lot of action. Hell, Starman – which is one of my favorite series of all time – is about fathers and sons. The Flash was about fathers and sons for years, until Flash: Rebirth refocused the story on Barry and his mother’s murder. 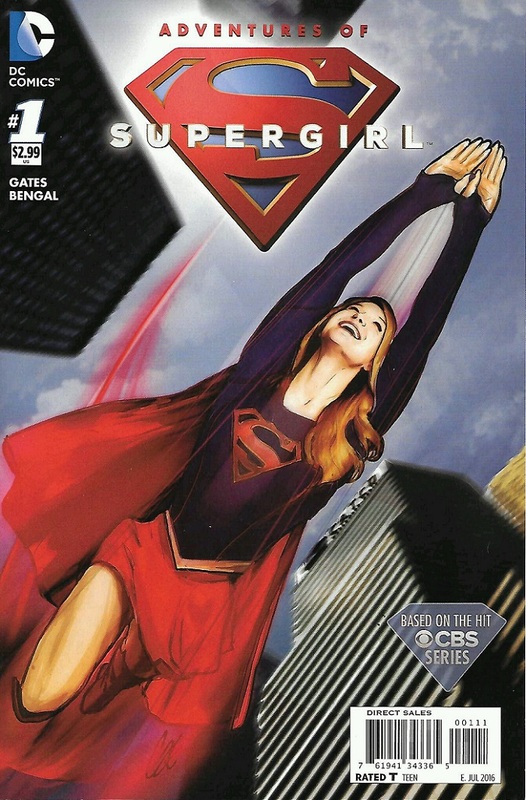 When I started writing Supergirl back in ’08, “Gilmore Girls” was one of my touchstones. Lorelai and Rory had an incredibly complex relationship, and I wanted to develop something like that for Supergirl. At the same time, I wanted to explore how grief affected a family and shook up their family dynamics. Alura wasn’t the most nurturing mother to begin with, but losing Zor-El in New Krypton caused her to harden and recede into grief. You had occasional flashes of mothering for Kara, but it wasn’t until Alura sacrificed herself to save Kara in War of the Supermen that you really saw her as the parent we all hoped she’d be. In the show continuity, Kara is learning a LOT about her mother, isn’t she? It seems like every episode, Kara gets a clearer picture of what her mother was like as an adult, and she’s learning it from her mother’s peers. When we’re children, we deify our parents. We assume everything they do is morally good and completely just. Kara is learning that it’s not always that simple, that sometimes parents hide their actions from their children in order to remain pure in a child’s eyes. I think a big part of adulthood is learning that your parents aren’t the perfect human beings you always assumed they were. I’m proud to have contributed a little nugget of that within the show’s continuity with Adventures. A: The Alex/Kara relationship is a key part of the show’s foundation. Much like with Alura, Kara learned a lot about her sister in your story. What do you think about Alex? What journey did you want the sisters to go through in your story? SG: I love how differently the Danvers sisters react to any given situation. Writing the two of them is a complete joy, and I hope Adventures continues if only so I can write more dialogue between them! [laughs] They’re just an awesome relationship to write. One of the priorities for me with this story was to explore some of Alex’s early days and potential mistakes she made as a young D.E.O. agent. I also wanted the two sisters to gain a better idea of how the other one thinks. Spoilers galore, but at the beginning of the story, Supergirl is trying to talk Rampage down with an open hand and Alex is ready to bring in the big guns. By the story’s end, those two approaches are completely flipped, with Alex opting to show Rampage compassion and ask forgiveness and Supergirl understanding that the only way to stop Facet is with a show of force to subdue her – something Facet understands all too well. Like I said, I love the sisters and hope to write more for the two of them in the future. A: You have been getting a lot of love for your new Supergirl motto ‘hope, help, and compassion for all’. I think it’s great! How hard was it to distill Kara’s persona down to that? Were there other words or thoughts you considered? SG: I always wanted it to be “hope” and “help.” Superman stands for “truth and justice,” right? Those concepts are very tangible things that Superman can go after with his mission, two things that Superman himself stands for. I wanted something like that for Supergirl, but something that spoke more to her empathic nature...a phrase that said all you need to know about that character. 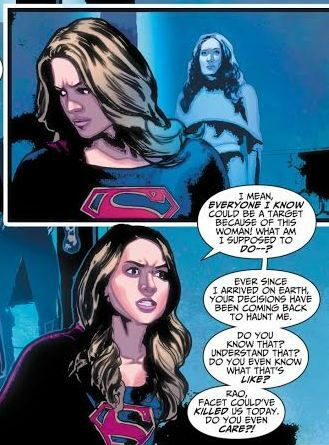 So “hope” and “help” were touchstones, things that Kara both represents and that she strives to do. The kicker of the motto, however, took some time. It’s hard to beat “the American Way,” honestly. (Though in researching that, I was reminded that it wasn’t even part of Superman’s original motto but was grafted on after World War 2 and the Cold War began.) We’ve tried a bunch of variations for Supergirl over the years – notably “the Kryptonian Way” during New Krypton – but none of those rang true to me. I wanted the kicker to be a concept that embodies what I believe about Supergirl as well as spells out what she believes as a person. “Compassion for all” was what we came down on, and I think “hope, help, and compassion for all” is a wonderful motto for Kara. 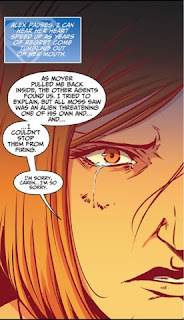 To me, it says a lot about what Supergirl believes. It’s both her mission statement and what she hopes people believe in...well, and also what we hope humanity can offer. A: You have said in the past that you tried to write scripts that played on the strength of the different artists who appeared in the book. When did you know who was drawing which book? Did you have to go back and tinker with the scripts based on the artist? And can you give a couple of examples of script elements done for a particular artist? Everyone was just so excited to be working with this character, and everyone was anxious to draw the most insane stuff I could throw at them. I asked Bengal to draw an empty football stadium and he spent two days drawing all those empty seats and people running around! I think it’s actually one of the best pieces of art in the entire book, too, just because he took so much care in it. That guy’s a master draftsman, and I’m ecstatic we had him for the first three chapters of the book. Bengal set a perfect tone for this book, lots of heart, humor, and big action. Bengal’s great with action, emotion, scene setting, colors...he’s the entire package. I think he’s gonna be recognized as a huge force in comics before we know it. Speaking of wonderful artists, how great was Cat Staggs?! Her covers were just PHENOMENAL, but I was ecstatic when she agreed to draw Chapter 10. She specifically asked to do a really emotional chapter with Kara, and the conversation with Alura fit that perfectly. And she drew the heck out of it! Just like she draws the heck out of everything else, really. I feel very, very fortunate to have all these incredible artists on board for this book, and I can’t thank them enough. I should also give a shout-out to my editors Kristy Quinn and Jess Chen for hiring all of them! Oh, and what about Pop Mhan, JonBoy Meyers, Carmen Carnero, and Emma Vieceli!? Man, everyone just rocked the hell out of this series. We were very fortunate to have all these top notch artists. Very fortunate. A: I’m hoping you get signed on for a ‘season two’. Any ideas you have been kicking around if you get asked again? And where can people look for you next? SG: I really hope DC decides to do another Adventures of Supergirl series. I always, always, always have more stories to tell with Supergirl, no matter the continuity or universe. Supergirl’s the character I most enjoy writing, and the character I’ve thought about more than any other character in comics...well, outside of the Flash, probably. Hopefully the sales numbers on the single issues and trade paperbacks are strong enough to convince them to give Adventures another go, but it’s ultimately up to them. A very interesting interview! Thank you! It's nice meeting a creative who respects the character and her story. Seriously, Kara is almost sixty-year-old and she is one of the oldest and most important Superman supporting characters. Pre-Crisis she had only two solo books, but her fans could read a new Supergirl adventure every single month for twenty-four years until DC killed her. And still she has very little respect from other comic-book fans. By the way, have you seen the trailer? After two missed chances -the eighties movies and Smallville- we can finally see both cousins flying together! And that worried but determined glance that they shared before flying out was awesome. and the American Way"... yeah, definately difficult, but one I think we can all get on board. Definately though, hope Adventures Season 2 is within the cards. And I agree with previous Anon. screen will be a treat to behold! A great interview. Thanks ANJ and thank you Sterling Gates. Nice work Anj, and thanks to Sterling for being such a pal to Kara, and to us. 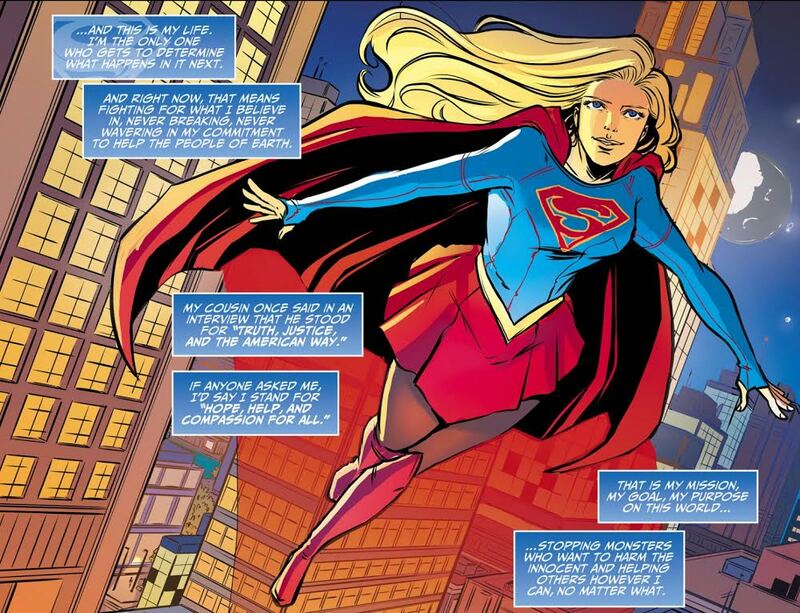 I hope to read more Sterling Supergirl's, and maybe even hear her on screen. ‘Hope, help, and compassion for all’ would look great on a Supergirl TV shirt. I look forward to see what animation Sterling Gates has been writing for lately.